Posted June 9th, 2015 at 2:39 pm. Crystal Des-Ogugua, Kiran Mansukhani, Sofi Chavez, Paola Bernal and Gissell Montoya. Paola Bernal of Houston, Texas. Paola is a Sociology major. Sofi Chavez of Seattle, Wash. Sofi is an English major. Crystal Des-Ogugua of Lewisburg, Pa. Crystal is a sociology major with a concentration in African-American studies. Kiran Pizarro Mansukhani of Great Neck, N.Y. Kiran is a philosophy major. Gissell Montoya of Houston, Texas. Gissell is an international studies major with a health studies minor. Celebrating its 26th year, the MMUF program identifies and supports students of great promise with the goal of helping them to become scholars of the highest distinction who go on to transform the academy. The new fellows above will join those from the class of 2016, who are beginning their second year with the program. The MMUF is a national program that serves to increase the number of minority students, and others with a demonstrated commitment to eradicating racial disparities, who will pursue Ph.D.s in core fields in the arts and sciences. Fellows conduct extended research projects in their junior and senior years, frequently presenting at conferences. Mellon Mays fellows who enroll in Ph.D. programs in the designated fields within 39 months of college graduation are eligible for repayment of their undergraduate loans up to $10,000. The Social Science Research Council and the Woodrow Wilson National Fellowship Foundation partner with the Mellon Mays program to support travel and research grants for fellows during graduate school, as they finish their dissertations, and into their careers as junior faculty members. Guided research is the foundation of the fellowship, and each fellow works closely with a faculty mentor. For details about current fellows’ research, visit the program website. In addition to meeting regularly with a faculty mentor, all Mellon Mays fellows meet as a cohort each week with Assistant Dean Vanessa Christman, who serves as the MMUF administrative coordinator, and Growth and Structure of Cities Professor Gary McDonough, who serves as the MMUF faculty coordinator. University of Pennsylvania doctoral student Leslie Jones serves as a graduate coordinator. 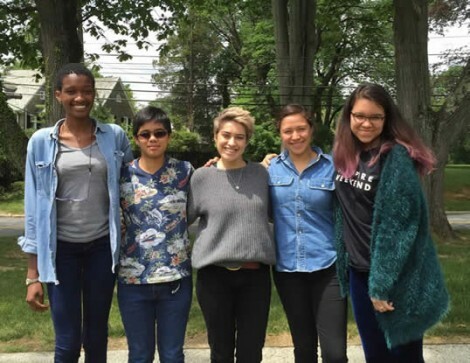 Bryn Mawr is one of eight institutions that have participated in the MMUF program since its inception in 1988; the program now operates at 42 colleges and universities.